We have been fishing with KEVIN for 19 years now, with our friends and with our family. We can tell you that when it comes to providing a professional, safe, and and successful fishing trip, Kevin is indeed The Reel McCoy! PS- And he ain’t no quitter! IMHO Kevin is the best and hardest working professional guide on the gulf coast. 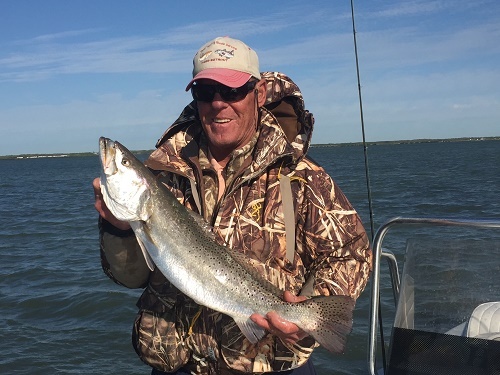 If you’re thinking about fishing from Rockport to Corpus Christi you need to call Kevin McCoy. KEVIN thanks for a great trip yesterday! The family will always remember their first trip with a guide and everyone caught their limit !!! "What a day".... can't wait to book you again next June . The Trader Family . Kevin my son and I had the greatest time fishing with you. When we both can limit by 7:30 you cannot beat that. We will be back. Thanks again Kevin for such a fun day on the water. Truly an honor and pleasure to fish with you. We had an absolute blast on the water with you today! Thans so very much for all of your patience & teaching us your expert techniques--We definitely learned a lot! Dad won't stop bragging about the 29" Trout. I'll be sending you a few photos from today. See you soon. As John Wayne often said, talk is cheap! But when it comes to catching trout and redfish on the Texas Gulf coast, you are the "Reel" McCoy!!! Thank you for your knowledge, your hard work, your PATIENCE, and your professionalism, and for a boat load of good memories on the water through the years. It truly is a pleasure, "Ketchin with Kevin. Just wanted to say thanks for the great fishing on our last four trips this year, Have to hand it to you we got our limits of trout every trip. Looking forward to our next trip next Tuesday, just keep us off the crab. Thanks again for the great job you do. Thank you for making another great set of memories for my grandson James Walling, his dad Curt Walling and me on Saturday. I can tell you that James is pretty pumped up about it, and therefore, so is his old grandad. EVERYONE had a great time. We appreciate you working us in on short notice, AND for the GREAT trip. Don`t know if you had anything to do with the weather being as great as the "catching" was, but we won`t argue that point one way or the other. It would be difficult to improve on either one!! Hope to fish with you again and hopefully in the very near future. Just wanted to say thanks for putting Billy and I on some nice reds, grilling on the half shell worked out quite well also. He will like telling stories about skinny water fishing now. Will look you up again and recommend you to friends as well.